Welcome to my stop on the 2014 New Quilt Blogger Blog Hop and many thanks to Beth for hosting. I have had a lot of fun reading posts from the other quilters on the Blog Hop and enjoyed seeing so many amazing quilts. I am Deborah, and I am originally from England, but grew up in India, married an Australian, and we currently call Indonesia home. I am a mum to two boys (age 11 and 7) and spend my days trying to keep up with them! In my previous life I was a geneticist and spent my days looking down a microscope at fruit fly embryos (don't ask!!) I learnt to quilt just over 2 years ago, and haven't looked back. At first I sewed everything by hand but now I have a machine I have been enjoying a mix of hand and machine stitching, including embroidery. I can't cope if I have too many projects on the go at once, and I love bright colours. I have made less than 10 quilts, so it isn't hard to show you my favourites. 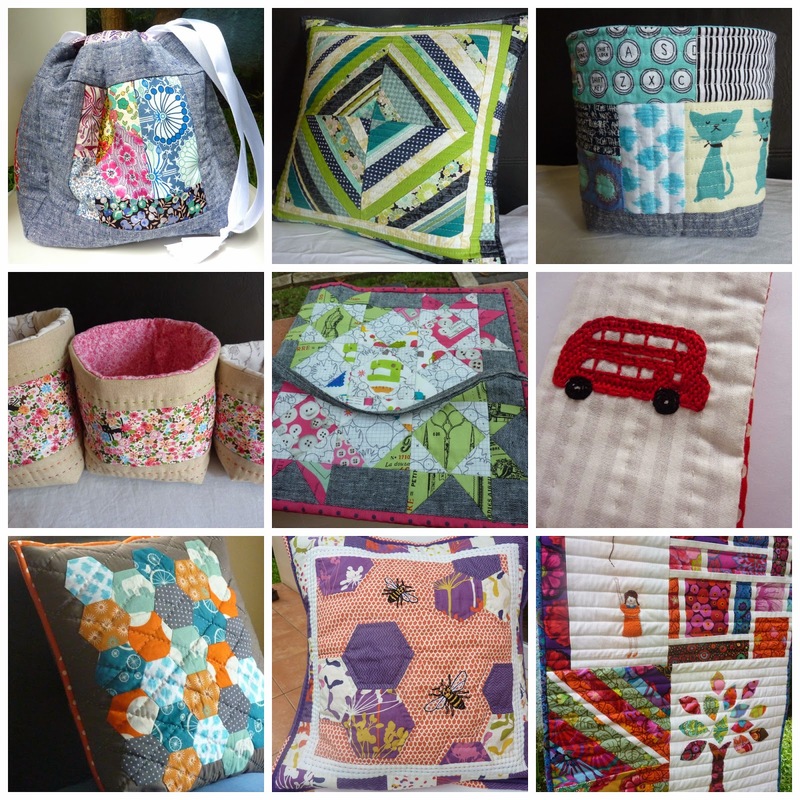 I made all of these this year and enjoyed the variety in the patterns and the quilting. I also love making smaller projects: mini-quilts, pouches, cushions. They make fun presents and provide some quick satisfaction! (Most of these projects were made before I started my blog so I can't provide links to them, but you can see them on my Flickr stream if you are interested). Over the next few months my goal is to learn to FMQ. I love straight-line quilting, but I am looking forward to a new challenge. I am also aiming to start a long-term hand pieced/quilted project, but haven't decided on a definite pattern or idea yet. Any suggestions? Favourite Book: A Suitable Boy by Vikram Seth. Favourite past-time: Drinking coffee in a cafe with a friend. Biggest dread: Big parties and tsunamis. Quilting tip: Use double the amount of pins for basting than you originally think! Lovely to read all these interesting tidbits! 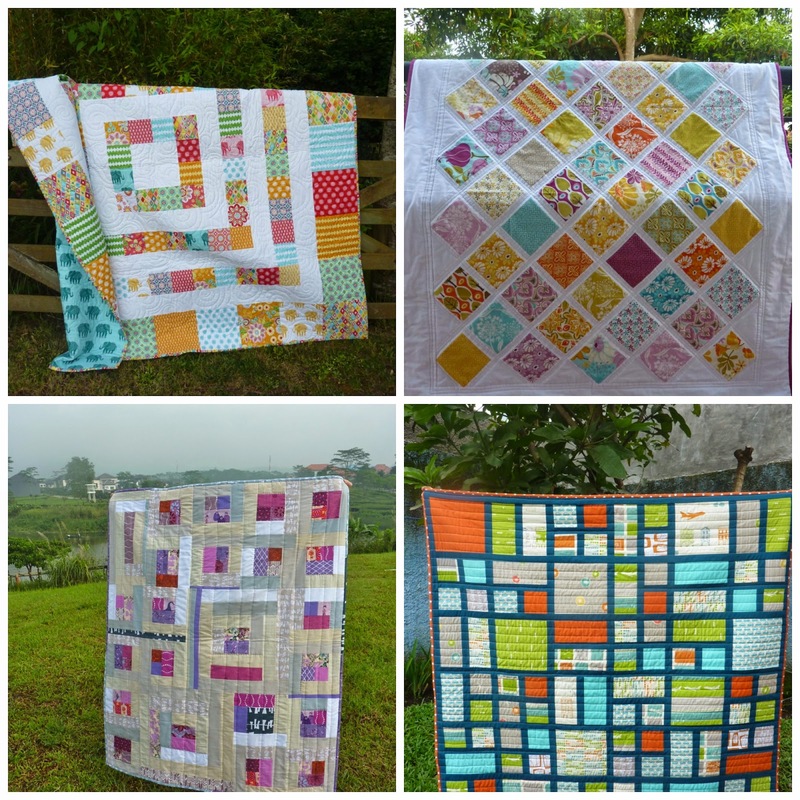 Love your quilts - and your little projects! I really like your style and it was lovely to read more about you. I love visiting your blog each and every time and this time is no exception :) If you would like a long term project, hand piecing, how about joining me and doing the Farmer's Wife? i knew you were a new blogger but i thought you had been quilting for awhile. You projects are all so pretty; i always enjoy seeing what you are making! what an interesting journey you have had from scientist to quilter!!! We had a Department of Agriculture fruit-fly trap in our front garden for ages. Now I know who to ask what they were up to! You are so right to remind us that we like to sew and happen to blog about it, not the other way around. It does make sense. I have loved making my Dear Jane quilt as each block is a fresh start and a fun challenge. You sew just 5 inches together and you feel a sense of accomplishment each time. If you are looking for a long-term hand project, I would suggest something like that - a small-block sampler quilt. Nice to meet you. You have come so far so quickly in your quilting journey. I think we often forget to take the time and enjoy the moment in this rush we call life. Blog when you can and want to after the sewing is important advice. Hi Deborah, nice to meet you! I love the quilts you posted, especially the radiant orchid and mosaic tiles. I just started an EPP project a few weeks ago. I didn't really have a plan when I started, which seems to be fine as it takes so much time anyway. I just checked out a book, Hexa-go-go, from the library which had a lot of different EPP projects in it, and a lot of projects that combine EPP with machine piecing. I'd recommend it! Where in Indonesia are you? I lived in Jakarta for a few years. So nice to get to know more about you, Deborah! I really like your Memories of India quilt, especially because the photo has the teaser of the lovely elephant backing. I hope you take your time and enjoy the process of learning to free motion quilt; I still love straight line quilting, but FMQing has been a fun adventure and learning process for me. Hi there, fellow Blog Hop host! 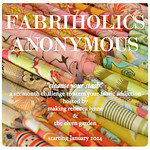 So many lovely projects here - I don't know that I can choose just one to comment on! I don't have much to offer as a suggestion for hand-quilting project, but I will say that my FMQ took a giant leap when I signed up for Pile O Fabrics SkillBuilder BOM for this year. It's been so much better for me than buying FMQ inspiration books... it really pushes my limits, but in small doses! I totally agree with the pins as long as they don't affect your quilting rhythm, although bunching definitely destroys rhythm. Your quilts are beautiful. I cannot pick a favorite of your quilts! They are all gorgeous! I am also wanting to learn how to FMQ and plan on starting the road to learning very soon here. Like the next week or two! I have a quilt that I am really wanting to make my first FMQ attempt almost ready to go! Good luck and keep us posted on your journey! your quilts are beautiful, I really love memories of India. Such beautiful quilts! We loved West Wing too, and I always run out of basting pins even though I keep buying more. I guess my quilts just keep getting bigger! I love bright colors too and I am trying to also find my "dark" side... who knows, maybe when winter hits! I think Liz's idea above me is great for the long on-going hand piecing quilt. I need to make a Farmers Wife quilt one of these days too; while I will admit I have no patience for hand piecing. Greta to learn more about you! I love your pairing of bright colors against a crisp white so classic and wonderful! You may not have made that many quilts so far but they are all wonderful so congrats. If I had to pin baste especially with free motion quilting I think I'd pull my hair out. I'm a spray baster because I don't like to stop until the bobbin runs out! So lovely to get to know you a bit better - your work is beautiful. Don't be afraid to jump in there and try FMQ! What great adventures you have had! Don't be scared of FMQ - it takes a lot of practice, but is fun. Really like your Radiant Orchind quilt! l've started learning FMQ this year and am happy with 2 patterns (stipple & loops) and am trying to get clamshell and figure of 8 down. It takes a bit of practice but is grand and quick! I love your blog, youre always making something wonderful. I didn't know you grew up in India, which part? And you were a geneticist, that is so cool! Good on you for making FmQ a goal. I didn't know you grew up in India! Very cool to learn more about you. :) I spent a study abroad in Kerala and also love to read novels by Indian writers. I've heard good things about "A Suitable Boy" but haven't picked it up yet. I'll have to read it now for sure. Wow I love that radiant orchid quilt! Actually all your projects are fantastic! I'll have to read your book recommendation. I read quite a few Indian authors and like most of them. What part of India are you from? Your quilts are lovely! What's fabric buying like in Indonesia? And how did you end up there? Thanks for dropping in to visit my site last week - I'm still catching up on all the comments. I'm a bit late visiting on the blog hop. 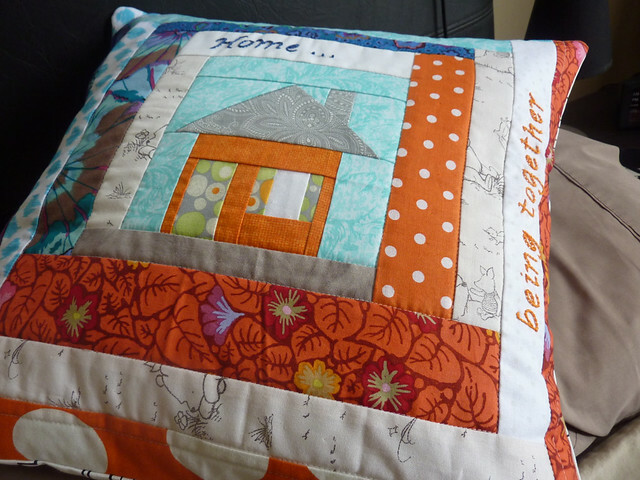 Beautiful quilts and I especially love all your smaller projects - I like quick satisfaction with my sewing too! The slow blogging idea sounds great as well, I'm off to take a look. And a longer project idea? Depends on your definition of 'long', personally I couldn't cope with the Farmers Wife scale of 'long', but I really like an idea I've seen recently - making a block a day for a month, maybe with some connection to the day so it's a memory quilt in a way, and then putting it together at the end. I haven't done it yet, but I will when life feels a bit less busy! It will give me some amount of a long term project but also the quick satisfaction of completing an element each day. Have a look here on http://thewindyside.blogspot.co.uk/2014/07/block-day-july-week-3.html - if you're interested. Deborah, that hexie Piper DS bee pillow is awesome! I love that line and what you did with the layout is gorgeous : ) Popping over belatedly from the hop and so glad I did because I love your palettes and layouts! Hi nice I meet you! What an interesting life you've lead, living all over the world. What nationality do you think of yourself and your sons as? I was just wondering. I'm Australian. You have made some beautiful quilts. I have very similar tastes in colours and pattern designs. Hi Deborah, Love the name of your blog! Your projects have a nice variety to them and they're beautiful. I'm not actually sure which I like best (not that I need to choose!). Thanks for the link to your flickr page - I just started following you. I've gone from straight line quilt to quilting waves with my walking foot - I'm thinking of it as halfway to fmq!